I regard the theater as a serious business, one that makes or should make man more human, which is to say, less alone. Arthur Asher Miller (17 October 1915 – 10 February 2005) was an American playwright, essayist, and author. Widely recognized as one of the most significant American playwrights of the 20th Century, he won the Pulitzer Prize in 1948 for Death of a Salesman. By whatever means it is accomplished, the prime business of a play is to arouse the passions of its audience so that by the route of passion may be opened up new relationships between a man and men, and between men and Man. There's too much of an attempt, it seems to me, to think in terms of controlling man, rather than freeing him. Of defining him rather than letting him go. It's part of the whole ideology of this age, which is power-mad. I think now that the great thing is not so much the formulation of an answer for myself, for the theater, or the play — but rather the most accurate possible statement of the problem. A playwright … is … the litmus paper of the arts. He's got to be, because if he isn't working on the same wave length as the audience, no one would know what in hell he was talking about. He is a kind of psychic journalist, even when he's great. When irrational terror takes to itself the fiat of moral goodness somebody has to die. … No man lives who has not got a panic button, and when it is pressed by the clean white hand of moral duty, a certain murderous train is set in motion. I understand his longing for immortality … Willy's writing his name in a cake of ice on a hot day, but he wishes he were writing in stone. He wants to live on through something — and in his case, his masterpiece is his son… all of us want that, and it gets more poignant as we get more anonymous in this world. The number of elements that have to go into a hit would break a computer down…. the right season for that play, the right historical moment, the right tonality. In the theater, while you recognized that you were looking at a house, it was a house in quotation marks … on screen, the quotation marks tend to be blotted out by the camera. The problem was to sustain at any cost the feeling you had in the theater that you were watching a real person, yes, but an intense condensation of his experience, not simply a realistic series of episodes. It isn't easy to do in the theater, but it's twice as hard in film. A playwright lives in an occupied country… And if you can't live that way you don't stay. I was very moved by that play once again when the Royal Shakespeare Company did a production that toured the cathedrals of England. Then they took it to Poland and performed it in the cathedrals there, too. The actors said it changed their lives. Officials wept; they were speechless after the play, and everyone knew why. It was because they had to enforce the kind of repression the play was attacking. That made me prouder than anything I ever did in my life. The mission of the theater, after all, is to change, to raise the consciousness of people to their human possibilities. I'm a fatalist. … I consider I am rejected in principle. My work is and, through my work, I am. If it's accepted, it's miraculous or the result of a misunderstanding. They don't need me in New York. I'm the New England man. I'm vital in New England. I simply asked him if he was making any money. Is that a criticism? Why must everybody like you? I don't say he's a great man. Willy Loman never made a lot of money. His name was never in the paper. He's not the finest character that ever lived. But he's a human being, and a terrible thing is happening to him. So attention must be paid. He's not to be allowed to fall into his grave like an old dog. Attention, attention must be finally paid to such a person. Personality always wins the day. You can't eat the orange and throw the peel away — a man is not a piece of fruit. Work a lifetime to pay off a house — You finally own it and there's nobody to live in it. Ben, that funeral will be massive! They'll come from Maine, Massachusetts, Vermont, New Hampshire! All the old-timers with the strange license plates — that boy will be thunderstruck, Ben, because he never realized — I am known! Rhode Island, New York, New Jersey — I am known, Ben, and he'll see it with his eyes once and for all. Spite, spite, is the word of your undoing! You cut your life down for spite! Isn't that — isn't that remarkable? Biff — he likes me! Nobody dast blame this man. Willy was a salesman. And for a salesman, there is no rock bottom to the life. He don't put a bolt to a nut, he don't tell you the law or give you medicine. He's a man way out there in the blue, riding on a smile and a shoeshine. And when they start not smiling back — that's an earthquake. And then you get yourself a couple of spots on your hat, and you're finished. Nobody dast blame this man. A salesman is got to dream, boy. It comes with the territory. Nothing's Planted, I don't have a thing in the ground. I think the tragic feeling is evoked in us when we are in the presence of a character who is ready to lay down his life, if need be, to secure one thing — his sense of personal dignity. Only the passive, only those who accept their lot without active retaliation, are "flawless." Most of us are in that category. But there are among us today, as there always have been, those who act against the scheme of things that degrades them, and in the process of action everything we have accepted out of fear of insensitivity or ignorance is shaken before us and examined, and from this total onslaught by an individual against the seemingly stable cosmos surrounding us — from this total examination of the "unchangeable" environment — comes the terror and the fear that is classically associated with tragedy. More important, from this total questioning of what has previously been unquestioned, we learn. Abby, I may think of you softly from time to time. But I'll cut off my hand before I ever reach for you again. A child's spirit is like a child, you cannot catch it by running after it; you must stand still, and, for love, it will soon itself come back. We cannot look to superstition in this. The Devil is precise; the marks of his presence are definite as stone. I have trouble enough without I come five mile to hear him preach only hellfire and bloody damnation. Take it to heart, Mr. Parris. There are many others who stay away from church these days because you hardly ever mention God any more. Hale: Here is all the invisible world, caught, defined, and calculated. In these books the Devil stands stripped of all his brute disguises. Here are all your familiar spirits — your incubi and succubi; your witches that go by land, by air, and by sea; your wizards of the night and of the day. Have no fear now — we shall find him out if he has come among us, and I mean to crush him utterly if he has shown his face! Hale: I cannot tell. If she is truly in the Devil's grip we may have to rip and tear to get her free. I have seen too many frightful proofs in court — the Devil is alive in Salem, and we dare not quail to follow wherever the accusing finger points! Proctor: Spare me! You forget nothin' and forgive nothin.' Learn charity, woman. I have gone tiptoe in this house all seven months since she is gone. I have not moved from there to here without I think to please you, and still an everlasting funeral marches round your heart. I cannot speak but I am doubted, every moment judged for lies, as though I come into a court when I come into this house! Elizabeth: I do not judge you. The magistrate sits in your heart that judges you. I never thought you but a good man, John — only somewhat bewildered. I'll plead no more! I see now your spirit twists around the single error of my life, and I will never tear it free! I like it not that Mr. Parris should lay his hand upon my baby. I see no light of God in that man. I'll not conceal it. Theology, sir, is a fortress; no crack in a fortress may be accounted small. Though our own hearts break, we cannot flinch; these are new times, sir. There is a misty plot afoot so subtle we should be criminal to cling to old respect and ancient friendships. I have seen too many frightful proofs in court — the Devil is alive in Salem, and we dare not quail to follow wherever the accusing finger points! Is the accuser always holy now? Were they born this morning as clean as God's fingers? I'll tell you what's walking Salem — vengeance is walking Salem. We are what we always were in Salem, but now the little crazy children are jangling the keys of the kingdom, and common vengeance writes the law! This warrant's vengeance! I'll not give my wife to vengeance! We burn a hot fire here; it melts down all concealment. A person is either with this court or he must be counted against it, there be no road between. This is a sharp time, now, a precise time — we live no longer in the dusky afternoon when evil mixed itself with good and befuddled the world. Danforth: Then there is a prodigious guilt in the country. Are you afraid to be questioned here? Hale: I may only fear the Lord, sir, but there is fear in the country nevertheless. Danforth: Reproach me not with the fear in the country; there is fear in the country because there is a moving plot to topple Christ in the country! Hale: But it does not follow that everyone accused is part of it. Danforth: No uncorrupted man may fear this court, Mr. Hale! In an ordinary crime, how does one defend the accused? One calls up witnesses to prove his innocence. But witchcraft is ipso facto, on its face and by its nature, an invisible crime, is it not? Therefore, who may possibly be witness to it? The witch and the victim. None other. Now we cannot hope the witch will accuse herself; granted? Therefore, we must rely upon her victims — and they do testify, the children certainly do testify. As for the witches, none will deny that we are most eager for all their confessions. Therefore, what is left for a lawyer to bring out? I think I have made my point. Have I not? A fire, a fire is burning! I hear the boot of Lucifer, I see his filthy face! And it is my face, and yours, Danforth! For them that quail to bring men out of ignorance, as I have quailed, and as you quail now when you know in all your black hearts that this be fraud — God damns our kind especially, and we will burn, we will burn together! You're pulling heaven down, and raising up a whore! It is mistaken law that leads you to sacrifice. Life, woman, life is God's most precious gift; no principle, however glorious, may justify the taking of it. I beg you, woman, prevail upon your husband to confess. Let him give his lie. Quail not before God's judgment in this, for it may well be God damns a liar less than he that throws his life away for pride. John, I counted myself so plain, so poorly made, no honest love could come to me! Suspicion kissed you when I did; I never knew how I should say my love. It were a cold house I kept! Danforth: Do you mean to deny this confession when you are free? Proctor: [With the cry of his whole soul] Because it is my name! Because I cannot have another in my life! Because I lie and sign myself to lies! Because I am not worth the dust on the feet of them that hang! How may I live without my name? I have given you my soul; leave me my name! I do think I see some shred of goodness in John Proctor. Not enough to weave a banner with, but white enough to keep it from such dogs. Give them no tear! Tears pleasure them! Show honor now, show a stony heart and sink them with it! Who weeps for these, weeps for corruption! He have his goodness now, God forbid I take it from him! I am bewildered by the death of love. And my responsibility for it. I think it's a mistake to ever look for hope outside of one's self. One day the house smells of fresh bread, the next of smoke and blood. One day you faint because the gardener cuts his finger off, within a week you're climbing over corpses of children bombed in a subway. What hope can there be if that is so? I tried to die near the end of the war. The same dream returned each night until I dared not to go to sleep and grew quite ill. I dreamed I had a child, and even in the dream I saw it was my life, and it was an idiot, and I ran away. But it always crept onto my lap again, clutched at my clothes. Until I thought, if I could kiss it, whatever in it was my own, perhaps I could sleep. And I bent to its broken face, and it was horrible … but I kissed it. I think one must finally take one's life in one's arms. Look, we're all the same; a man is a fourteen-room house — in the bedroom he's asleep with his intelligent wife, in the living-room he's rolling around with some bareass girl, in the library he's paying his taxes, in the yard he's raising tomatoes, and in the cellar he's making a bomb to blow it all up. Arthur was the last of the three great theatrical voices of the American century — O'Neill, Williams, Miller. … Arthur's special achievement was to make political and social plays which belonged on Broadway and yet were also powered to reach out into America and way beyond. The greatest playwright of the 20th century. 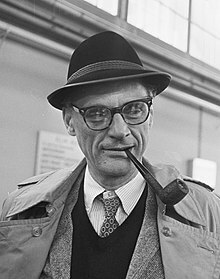 I have come across several articles by the American playwright Arthur Miller in which he sets out to denounce Stalin's purges and Brezhnev's invasion of Czechoslovakia but ends up denouncing America. 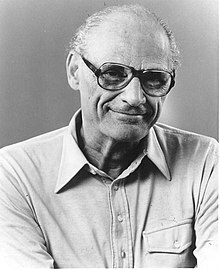 Living in America, Arthur Miller wrote all the plays he wanted to write, had them produced, and was amply rewarded by money and fame. 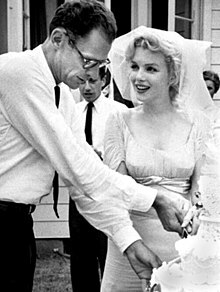 He also managed to have everything his heart desired, including the most fabulous blonde of his day. Why then this loathing for America? The only explanation I can think of is that Miller is too self-righteous and self-important to admit the gross stupidity of his Stalinist commitment. He must go on trying to convince the world that there is not much to choose between Russia and America.